Brown China - 314 items found. Lovely large teapot with ribbed detail around the base. 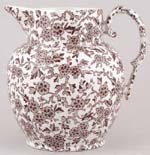 Backstamp: Real English Ironstone Adams Made in England Established 1657 Sharon. Excellent condition. 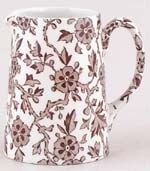 Backstamp: Real English Ironstone Adams Made in England Established 1657 Sharon. Minor wear mainly to outer rim overall excellent condition. 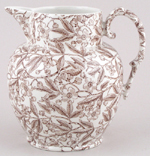 Lovely jug with ornate handle and decorative moulded detail to the body. Backstamp: Gem Florentine China. Light all over crazing and a little wear to the rim, foot and handle. 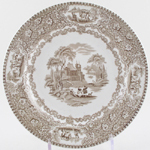 Large plate with attractive indented rim. Backstamp: Real Iron-Stone China and in script 143. Light crazing with a little wear to the rim otherwise excellent condition. 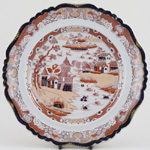 Attractive plate with delightful vignettes of pattern to the border. Backstamp: Italian Lakes J & M P Bell & Co and an impressed bell. Crazed and on the back some minor discolouration and blue smudging. Made in England. Brand new and first quality, dishwasher and microwave safe. Brown Arden. Replacement lid for the smaller round 1 pint 0.6 ltr teapot. Minor variations in size may result in a replacement lid fitting less well than the original. This item has been discontinued by Burleigh and is no longer available. Made in England. Brand new and first quality, dishwasher and microwave safe. Brown Arden. Replacement lid for the larger round 1.75 pint 1.05 ltr teapot. Minor variations in size may result in a replacement lid fitting less well than the original. This item has been discontinued by Burleigh and is no longer available. Made in England. Brand new and first quality, dishwasher and microwave safe. Brown Arden. Large serving plate. This item has been discontinued by Burleigh and is no longer available. Made in England. Brand new and first quality, dishwasher and microwave safe. Brown Arden. Saucer 5.75 ins 14.5 cm diameter. This item has been discontinued by Burleigh and is no longer available. Made in England. Brand new and first quality, dishwasher and microwave safe. Brown Arden. Saucer 6.5 ins 16.5 cm diameter. This item has been discontinued by Burleigh and is no longer available. Made in England. Brand new and first quality, dishwasher and microwave safe. Brown Asiatic Pheasants. Replacement lid for the smaller round 1 pint 0.6 ltr teapot. Minor variations in size may result in a replacement lid fitting less well than the original. This item has been discontinued by Burleigh and is no longer available. Made in England. Brand new and first quality, dishwasher and microwave safe. Brown Asiatic Pheasants. Replacement lid for the larger round 1.75 pint 1.05 ltr teapot. Minor variations in size may result in a replacement lid fitting less well than the original. This item has been discontinued by Burleigh and is no longer available. Made in England. Brand new and first quality, dishwasher and microwave safe. Brown Asiatic Pheasants. 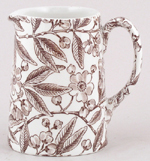 This item has been discontinued by Burleigh,and is no longer available. Made in England. Brand new and first quality, dishwasher and microwave safe. Brown Asiatic Pheasants. Large serving plate. 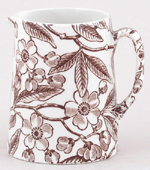 This item has been discontinued by Burleigh and is no longer available. Made in England. Brand new and first quality, dishwasher and microwave safe. Brown Asiatic Pheasants. Saucer 5.75 ins 14.5 cm diameter. This item has been discontinued by Burleigh and is no longer available. Made in England. Brand new and first quality, dishwasher and microwave safe. Brown Asiatic Pheasants. Saucer 6.5 ins 16.5 cm diameter. This item has been discontinued by Burleigh and is no longer available. Made in England. Brand new and first quality, dishwasher and microwave safe. Brown Prunus. 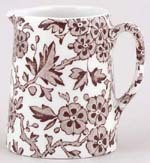 Great size for soft drinks or looks lovely with flower display. This item has been discontinued by Burleigh and is no longer available. Made in England. Brand new and first quality, dishwasher and microwave safe. Brown Prunus. Replacement lid for the smaller round 1 pint 0.6 ltr teapot. Minor variations in size may result in a replacement lid fitting less well than the original. This item has been discontinued by Burleigh and is no longer available. Made in England. Brand new and first quality, dishwasher and microwave safe. Brown Prunus. Replacement lid for the larger round 1.75 pint 1.05 ltr teapot. Minor variations in size may result in a replacement lid fitting less well than the original. This item has been discontinued by Burleigh and is no longer available.